Once you have Created your Sales Order, you will want to manage the status of your order from a draft state to a confirmed state. And, at times, you may need to move it back to draft state. At the top of the sale details page, you'll see three empty bars representing the status of your sale. This "status area" shows the overall status of the sale (whether it's been confirmed, is complete or is still in the draft state), the financial status (of any invoices raised for the sale), and the fulfillment status. As your sale progresses from draft to complete, you'll see these status bars turn green. An orange bar represents a intermediate state (partially shipped or partially paid for). Also note directly below these three bars you will see the "Can't Confirm" button. Directly below the "Can't Confirm" button, you will see the reasons you are unable to "Confirm" the sale. These are the items you will need to focus on updating. Once they are updated, you will see the text at the end of each line item change from the "X Fix" state to the "Fixed" state. The area below the progress bar contains the customer details and details of the individual sale (e.g. payment terms, agent name, billing address etc). You can click the various links to enter or later edit the data shown here. As an example, below, the Billing Contact is missing. If you click on the "None", you can select from existing contacts listed in this Customers' Contacts list or you can Add a New One. Sales created in Stitchex start their existence in the DRAFT state. In this state, you will add products to build your tentative customer order. You can also create a line sheet for your customer, collect further customer details, make notes etc. In the draft state you can print an Order Confirmation document to send to the customer. You can regenerate and resend this document to your customer as you make changes to the order. Draft sales are not included in production requirements. That is to say, Stitchex won't suggest you manufacture products to cover quantities present in draft sales. Only confirmed sales are included in those. When you area ready, you can mark the order as confirmed by clicking the "Confirm" button. 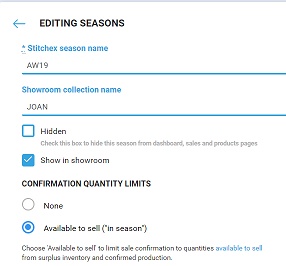 Note: If you receive "Not enough inventory available" to confirm your order, please make sure you do not have the Season (Settings>Season) configured to "Available to sell ("in season")". If so, you must have "in stock" or "in production" orders to work with. To resolve, set Confirmation Quantity Limits to "None". Once confirmed, the contents of the original order are locked. 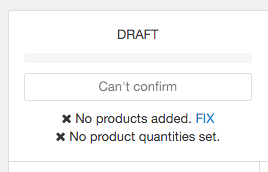 If you need to add products to the order, you will need to revert the order back to the unconfirmed, draft state before reconfirming. To cancel products or reduce quantities you can create a Cancellation document and optionally a Credit Note. Only confirmed orders are included in the production requirements that Stitchex calculates. You can view your production requirements on the "Required by SKU" inventory report. Once you have fixed all "errors" preventing you from "Confirming the Sale", click the "Confirm Sale" button in the top portion of the screen as described earlier. You will then be presented with an opportunity to create a "pro-forma invoice" for the sale or Just Confirm the sale. See our Knowledge Article on Pro-forma Invoices for more information. After you click the "Just confirm" button, you are immediately prompted to select your Invoice Strategy. 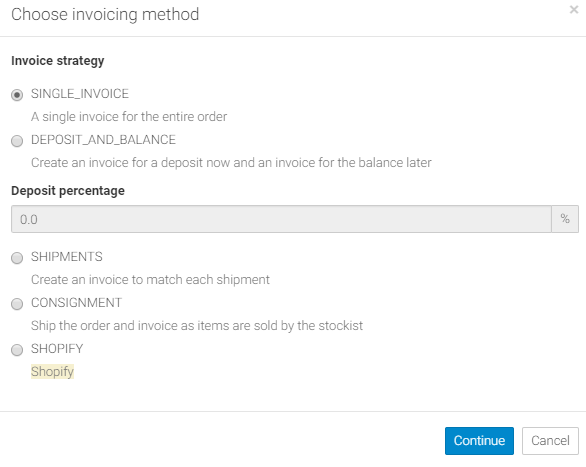 Then, click "Create Invoice". See our Knowledge Article on Invoicing Methods to help you with your decision. You will notice your Status Bars are now changed showing the order is Confirmed and the Invoice has been created with an outstanding balance. It is showing "yellow" because nothing has been paid. See our Knowledge Articles on processing Payments. When all quantities in a sale have been shipped (or cancelled), and all quantities have been invoiced and paid for Stitchex will automatically mark the sale as completed.